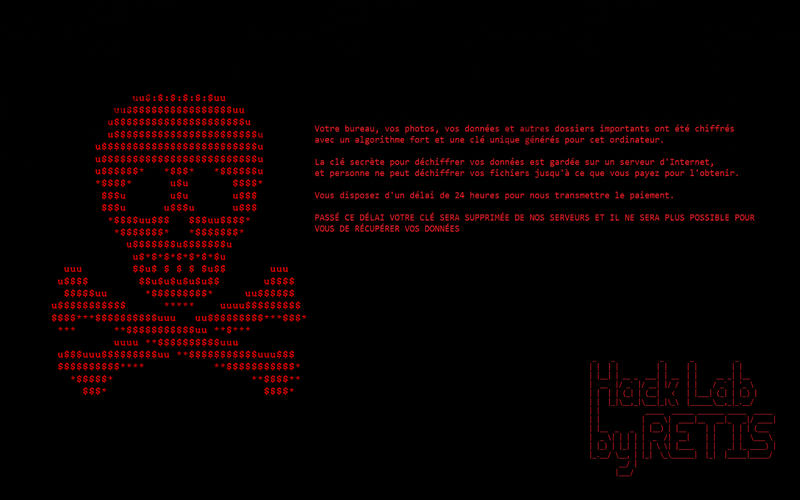 Malware developers constantly develop ransomware programs. Our researchers have discovered yet another application of this classification, which goes by the name of Retis Ransomware. Such malicious programs are favored by malware developers because they allow them to make illegal profits quickly and easily. The scheme under which such devious applications function is rather simple. Upon intrusion, they lock vast quantities of files without any notification or authorization and then asks for a payment in return for decryption. To have an in-depth understanding of how this malware functions, be sure to read our article entirely. You will also find a few important virtual security tips that will help you keep your operating system clean and secure at all times. For users, who already have Retis Ransomware active on their computer, we include a detailed removal guide, which will help you delete this malicious program once and for all in no time at all. Retis Ransomware functions in a relatively simple manner. As soon as it successfully enters your operating system, it immediately determines the contents of your hard drive for data, which it will lock up. Once that is done, this malware starts a completely silent encryption procedure. Due to that, this ransomware blindsides the majority of users, which it affects. During the encryption, this intrusive application uses an AES algorithm, which is notorious for its robust nature. Such cipher is primarily used to eliminate manual decryption. Each affected file is tagged with .crypted extension. Upon further analysis it has been discovered that the ransomware in question attacks file types such as .txt, .jpg, .png, .pdf, .xls, .doc, .docx, and quite a few others. It is also critical to highlight the fact that this devious piece of software mainly encrypts files stored in the %USERPROFILE% folder. As soon as your files are no longer accessible, you will notice a sudden change of your desktop image, which also serves as a ransom note. It tells you that your data is no longer accessible and that you must pay in return for decryption services within 24 hours; otherwise, all affected files will be compromised once and for all. While abiding by the demands of cyber crooks responsible for this malware might seem tempting, it is critical to note that even if you make the payment, there are no guarantees that your data will be unlocked. That is so because malware developers are not legally bound to unlock your files even if you pay up. It should be self-evident that you must delete Retis Ransomware once and for all. To do that we urge you to use the instructions below without any hesitation. During further analysis, our research team has discovered that in the majority of cases Retis Ransomware is distributed in a number of suspicious ways. Thus, to maintain a secure operating system, you must take preventative steps. In the majority of cases, this malicious program is spread via spam email campaigns. To reduce the risk of obtaining a devious installer in such a way, you need to refrain from all email attachments that come your way from unknown sources. Also, we urge you to download all of your applications only form their developers' websites because unauthorized distribution sites often host bundled installers. Such setup files are dangerous because they can be filled with suspicious and potentially harmful programs. Furthermore, you need to learn all about an application before you download it since malware developers are infamous for using manipulative marketing techniques to fool naive Internet users into obtaining their invasive programs. Last, but not least, be sure to install a professional antimalware tool if you do not have one because it provides overall system security; such a tool can identify and terminate any virtual security threat automatically. To delete Retis Ransomware once and for all, make use of the instructions, which you can find below. Keep in mind that you need to follow the instructions with your full attention. That is important because a single mistake could lead to an incomplete removal. If that happens, you might have to face undesirable outcomes, to put it lightly. For instance, active leftovers of Retis Ransomware could be enough for it to continue its malicious functionality. Also, those same traces might be employed to restore this malware silently. There are a few ways that you can avoid finding yourself in such a situation. You can manually check your PC for anything associated with Retis Ransomware, or you can scan your operating system with a reliable antimalware tool since it can identify and delete any potential leftovers automatically. Right-click a malicious .exe file and then select Delete. Keep in mind that the name of this file is random. Quick & tested solution for Retis Ransomware removal.